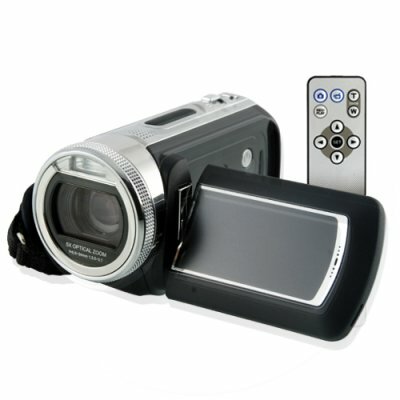 Successfully Added Hi-Def Digital Camcorder - Compact DV Camera to your Shopping Cart. Hi-Def 720p Digital Video Camera with amazing features including motion detection video capture. New wholesale high definition compact digital camcorder with smart profile and the ability to take up to 11MP photos. Among its many features, the CVSE-710 has a special motion detection feature, in this mode video is only shot once action starts taking place in front of the videocamera and shuts off three seconds after the motion is discontinued. It also features sharp 2.5 inch color LCD screen and takes best in class digital pictures and videos (has an impressive 5x OPTICAL zoom!). Includes one protected SD card slot for storing up 8GB's worth of video and uses a rechargeable li-ion camcorder battery for maximizing up time while out on location. Works in 10 user selected languages with a friendly menu interface and comes packaged with the highly regarded Arcsoft Media software suite. This camera comes out of the box ready to start taking pictures, and is available at the usual Chinavasion wholesale discount. Take advantage of the high resell potential of this item and order your stock online today. Chinavasion makes it easy with direct shipping and no M.O.Q (minimum order quantity)..